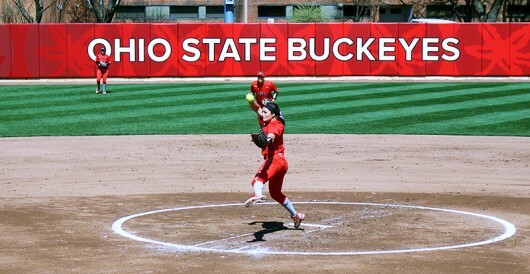 The Ohio State softball team (18-9, 3-0 Big Ten) blanked Indiana (25-9, 0-3 Big Ten) in the final game 2-0, sweeping the three-game series against the Hoosiers. Senior pitcher Morgan Ray recorded a complete game, striking out five while allowing two hits in seven innings pitched. Ray complimented the play of sophomore catcher Claire Nicholson in her seventh complete game of the season. Ohio State head coach Kelly Kovach Schoenly said Ray is a true competitor and a great model for the rest of the team, getting better every day. The game tied at zero until the fourth inning when senior second baseman Emily Clark doubled down the left field line, scoring senior shortstop Lilli Piper and giving the Buckeyes the lead. Freshman right fielder Kaitlyn Coffman singled up the middle, brought Clark in and extended the lead to 2-0 for Ohio State. After losing three games against Indiana this past year, Schonely said this was a big series for Ohio State. Ohio State will next take on Kentucky on the road Wednesday at 5 p.m.